THE PROCESS (MY PROCESS) OF WRITING | Carol Sheldon writes books exploring times-past through mystery, love, betrayal and murder. 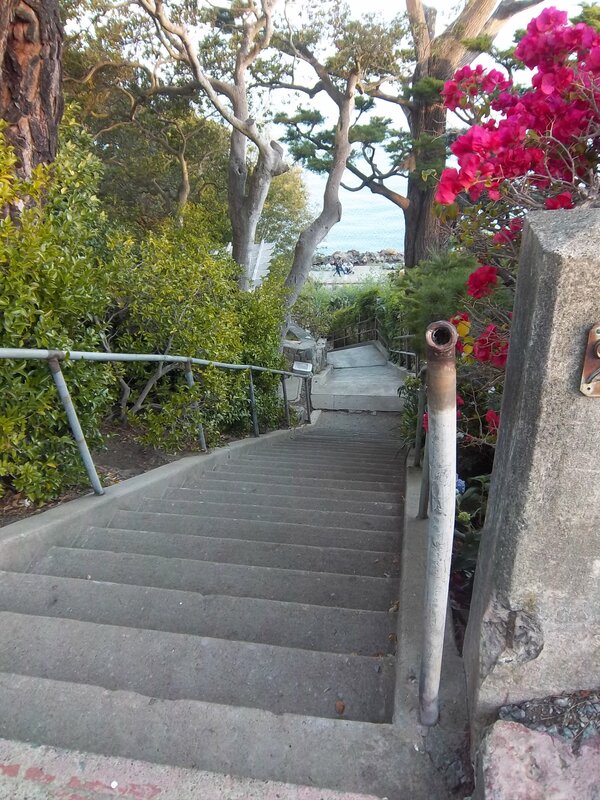 The picture is of one of the many hidden or almost comletely hidden stairways that wind their ways up the hills of Sausalito. Note the Bay and Angel Island at the bottom of the photo. It’s been another busy week of working on my new mystery novel about my town, Sausalito. I’ve written 100 pages now, so it’s going fast. Let me tell you how my process works. Every author had a different one, and I wouldn’t be so arrogant as to say this is how you should do it. It’s just what works for me. I have a lot in my head before there’s anything on paper—setting, protagonist, and in this case who gets murdered and why. I write bios for main characters. When I start writing—brainstorming, I try not to judge, writing all sorts of possibilities down. I have a general outline. For me, I’ve discovered that to try to write scene by scene outlines before I write the story doesn’t really work. It’s too right-brained, and inhibits the inspirations, surprises and creativity that can flow if I use a more organic approach. I sometimes feel as though my fingers are channeling the story. I may start a scene not knowing where it’s going at all, just that it fits within the general structure of my plot. I am continually surprised and delighted! After writing a few scenes, I fill in my outline, because that is really useful as a reference later on. Comments welcome from other writers. Hope you’ll stay with me until this new novel comes to life. This entry was posted in California, mystery, Sausalito, travel, writing. Bookmark the permalink.